In honor of Flag Day this past week, I thought this picture was very appropriate. It is near our beach and this flag flies year round!! Someone recently told me that if you wear a shirt that says you are a "local" then you are not. On another note... I know this t-shirt makes me feel like a local and is a favorite. It doubles as a swim suit cover up, paired with a skirt, or worn with my cut-off jean shorts (not daisy dukes but old jeans cut off above right above the knee), a bathing suit or a teddy/tank underneath. It is the perfect, do nothing outfit on a hot summer day! Throw on a hat (love the pony tail cut-out), stylish sunglasses, some simple earrings and you are ready to go!! People always ask me where I purchased this tee... so now you know too! This Garnet Hill swimsuit, fits like a dream. This hat has a pony tail cut-out! I bought mine at Nordstrom's, however, they are sold out. Found them on Amazon. I bought mine at a women's boutique in New Braunfels, TX called RiverRose. Love to shop there in person...and they have a great website! 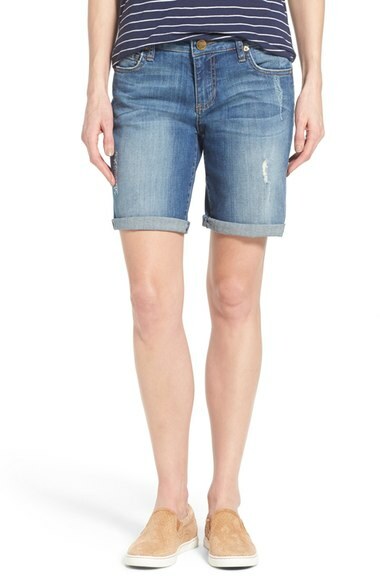 My cut-off jean shorts are old and well loved, however, you can find similar at Nordstrom. I only roll them when appropriate and love the frayed look.